Thursday morning, September 2, Goshen College’s first Egypt Study Service Term of 19 students departed for Cairo, Egypt. They arrived on time with no problems. Egypt SST embarked on an adventure that will take them from the Nile River through the desert and to the Red Sea. But members in the group won’t be wandering in the desert, thanks to Tom Meyers’ leadership. Trips include the city of Alexandria, known as the Pearl of the Mediterranean, and a Christian-Egyptian retreat center in the middle of the desert. “There are spectacular things to see on all these trips,” said Meyers. 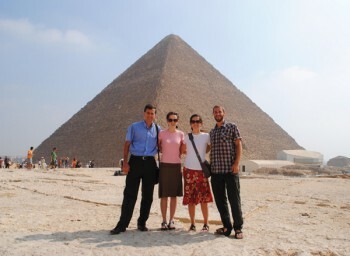 This Saturday, the group will visit the pyramids of Giza and Saqqara, which are among the oldest known pyramids. However, students will do more than sightseeing during their time in Egypt. The Middle East is one of the world’s most important geopolitical centers. “And perhaps,” adds Meyers, “one of the least understood by North Americans.” During through lectures and daily life, students will learn about Egypt’s “complex culture,” Meyers said. As a part of the culture, students will be completely immersed in the Arabic language. This made Tillie Yoder, a senior, stomach churn with nerves. Like many in the group, Yoder didn’t have the chance to study the language during the summer. But Meyers isn’t worried. “The study program has great Arabic teachers,” he said. Meyers will be working with Egyptian natives Heba Seoudi and Hanna Boktar to coordinate the study and service portions of the term. To follow the Egypt SST, go to www.goshen.edu/sst/.